I'm writing this post as the rain is lashing the windows, I'm wearing a cardigan and eating a bowl of soup for lunch. Yip, it's July. Where the heck has summer vanished to? I'm starting to think that I've fallen asleep and woken up in late October. This is supposed to be a post that celebrates summer and all I can think about is going to bed with my hot water bottle! Find somewhere quiet and meditate. Join in with seven days of Calm, a free programme on mindfulness and meditation. Click on the link and you will be transported to the lakes and mountains and greeted with the blissful sound of water and birdsong. It's a really great, gentle way to start the day and get your head on straight. Light a candle and fill your home with your favourite scent. I love the aromas of fresh florals and herbs and was delighted when Arum London sent me one of their hand-poured candles to try out. Filled with the clean, soothing scents of Jasmine and Mint, this is a candle that restores calm and helps you to leave stress behind. Made from 100% natural paraffin-wax, perfumes and essential oils free from parabens, they have a burn time of around 40 hours too. It's simply bringing the scents of summer indoors. And who knew that there was a proper way to look after a scented candle? Well there is and details are over on their site here. I definitely need a candle snuffer in my life now. Eat fresh, seasonal produce but treat yourself to your favourite guilty pleasure every now and again. Mine is macaroni cheese, what's yours? Here's a link to one of my favourite ethical lifestyle blogs, Moral Fibres. Wendy provides a breakdown each month of seasonal fruit and vegetables - this is the August list. And I'm loving the sound of her recipe for pickled cucumbers with fennel flowers. 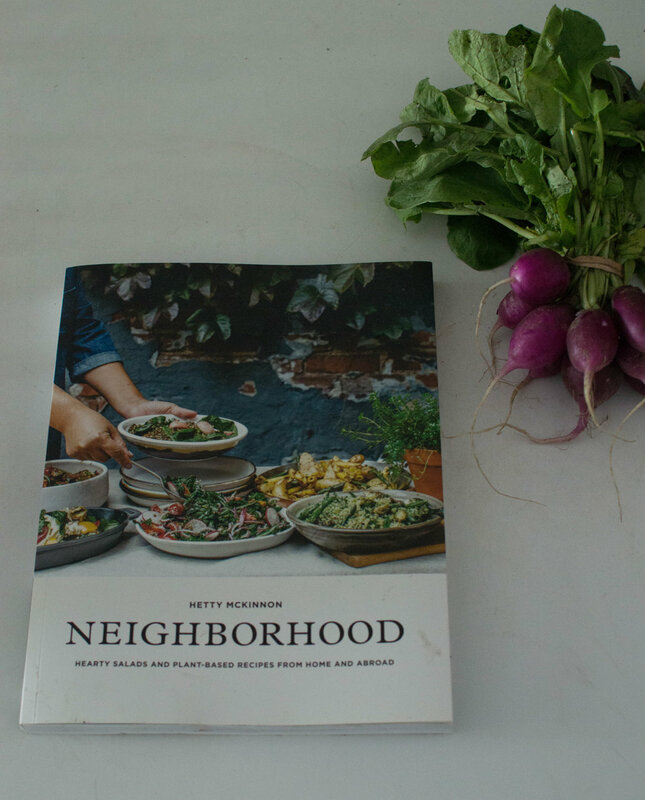 I recently bought the excellent new cookbook 'Neighborhood' by Hetty McKinnon. I discovered Hetty's Instagram feed several years ago when she was still based in Sydney and I longed to try her food. Her first book was difficult to get hold of in the UK but thankfully this one has been published over here and it's a belter. Stuffed full of hearty salads and plant-based dishes, we've cooked several recipes from it already and it's most definitely a winner in our household. Favourites include Basil-Lemon Scented Millet with Roasted Broccoli (we used quinoa instead of millet) and Panzanella with Roasted Tomatoes, Fennel, Kale and Caramelized Balsamic. It's full of stunning photography by Luisa Brimble too. And the best thing? The ingredients are simple - a few herbs, a nice dressing, a grain and a few veggies - no nonsense cooking. It's already well thumbed and grubby - the sign of a good cookbook in my opinion. The Green Balm from MOA (Magic Organic Apothecary) - this stuff is the bomb. I've had ridiculously dark, puffy circles under my eyes for so long but this has pretty much taken those away. It comes with a bamboo cloth to use as part of the cleansing ritual and is packed full of healing yarrow. It's suitable for my dry, sensitive skin but also works on all skin types. My skin is soft, clear of spots and feels better than it has in years. From The Future Kept here. After using the balm, I then massage in a little of their Aphrodite Facial Oil. It's enriched with Damask Rose essential oil and it's making my face glow. Together with the Green Balm it's the best £40 I've spent in a while. And they last for ages as you only need a tiny amount of each every time you use them. I've also recently discovered via Instagram, the very lovely Isla Apothecary. Reading their story, I was taken with the words 'the belief in the power of the skin and spirit to thrive with greater alignment to nature'. Each product is handcrafted in London using only raw, natural ingredients. I treated myself to one of their Reset Ritual Pulse Point Therapy roll-ons. I'm finding it particularly useful to use it before driving as I'm finding that super stressful these days. But it's also good to use it in times of anxiety and it claims to help calm muddled thoughts (of which I have many!). I certainly feel more positive after I've popped some on my wrist. Take time for yourself away from others. Go for a walk in the park, a stroll around a garden or head into the woods. Notice the little things - the leaves blowing in the breeze, the insects buzzing around the flowers, the warmth of the sun (if there is any!) on the back of your neck. I've written a piece over on the In The Moment magazine page all about wildflower walks and how they are a great way to reconnect and focus. You can check it out here. In The Moment magazine is a new monthly from the Mollie Makes team embracing mindful ways to live your life well. Here's a quick look at their second edition that they shared over on their Instagram feed. I'm also following this gentle yoga sequence for Summer from Ashley Neese. It's a short programme designed to restore balance and keep you grounded and it's designed to be done slowly. The idea is to do as much as you can and build up the positions gradually. It's a good way to get back into yoga too if you are out of practice. And those are my ways to ease myself into the summer holidays. If you have any other self-care tips for me I'd love to hear them.